The electric bike revolution is spreading across the continent, 2017 data clearly underlines that eBikes are the preferred mode of mobility. 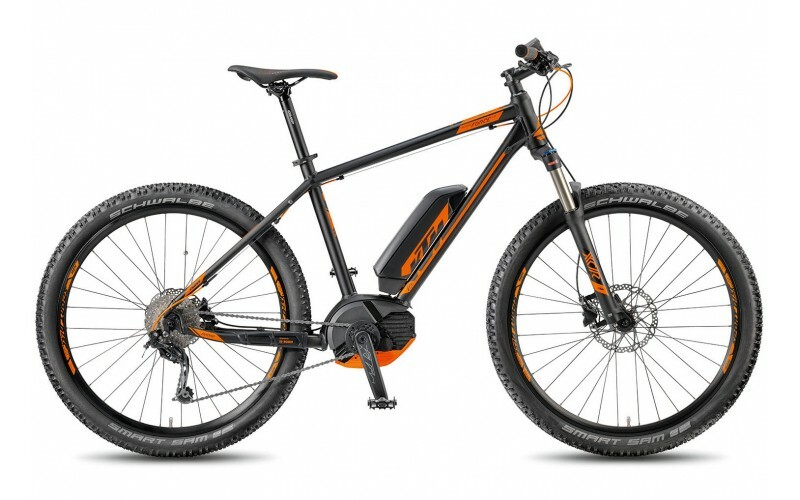 720,000 eBikes were sold in Germany, and KTM are one of the largest producers in their native country. As the market prospers, more and more manufacturers are jumping on the bandwagon than ever. KTM aren’t in the game for a ride on a profitable bandwagon, they began to focus on electric bikes 7 years ago, applying their expert research and knowledge in the 2-wheeled market to fantastic effect. One of the most impressive things about the KTM eBike range is their ability to utilise economies of scale, building high quality eBikes with great spec for very competitive prices. Bikes like the Macina Force 271 feature the top spec CX motor for just over £2,000, which is unheard of with other brands. 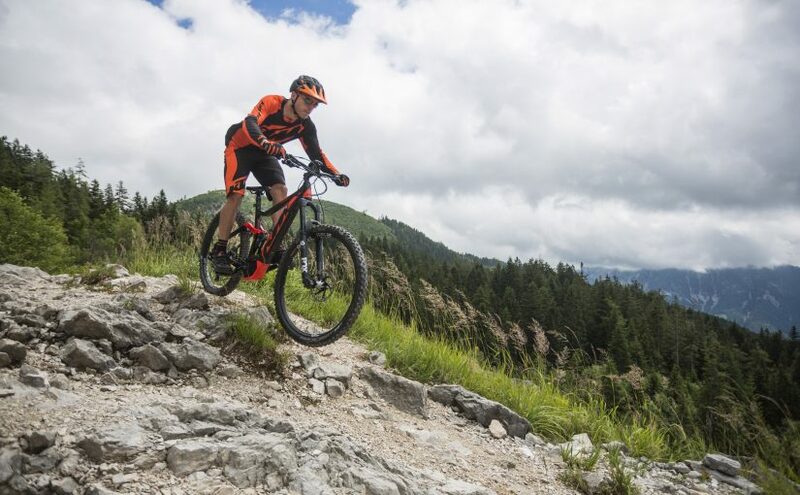 KTM have been famous for their electric mountain bikes over the years, the Kapoho, Fogo and Lycan all critically acclaimed by respected reviewers – GBMN, Electric Bike Review, and MBR. New for 2018, KTM have incorporated the Bosch PowerTube into their top end models. The PowerTube presents a minimalist, timeless look with sophisticated technology. Built with comfort and cruising in mind, the KTM Macina Gran is a contemporary master piece that’s a pleasure to ride. It’s perfect for commuting and relaxed leisure rides on light terrains. The Macina Gran has a 10-speed hub gear that’s easy to use and easy to maintain. It also allows you to ride in the correct cadence for what terrain you’re on. The Kapoho range from KTM might be one of the most eagerly anticipated KTM eBikes for 2018. It’s extremely well kitted out, with a host of the top specification options. Firstly, the Fox 36 A Float forks are eBike optimized, and can withstand the most rigorous of trails, downhill or uphill. In addition to the Fox forks, you have the new KTM Dimensions Mix (DiMMiX) technology, which gives the benefit of different sized tyres on front and rear, for increased control. The Bosch CX motor climbs descents with ease, and the 500Wh Bosch PowerTube battery lets your ride longer and makes going uphill enjoyable with the highly intuitive system. Presented in KTM’s emblematic orange and black, with an integrated battery for a stunning aesthetic. Sporty and powerful. This multi-purpose eBike encompasses a Bosch CX motor, 400Wh battery, Suntour Forks, Schwalbe Smart Sam tyres and Shimano hydraulic disc brakes for under £2200. We haven’t seen another eBike with this level of spec for a price this good. 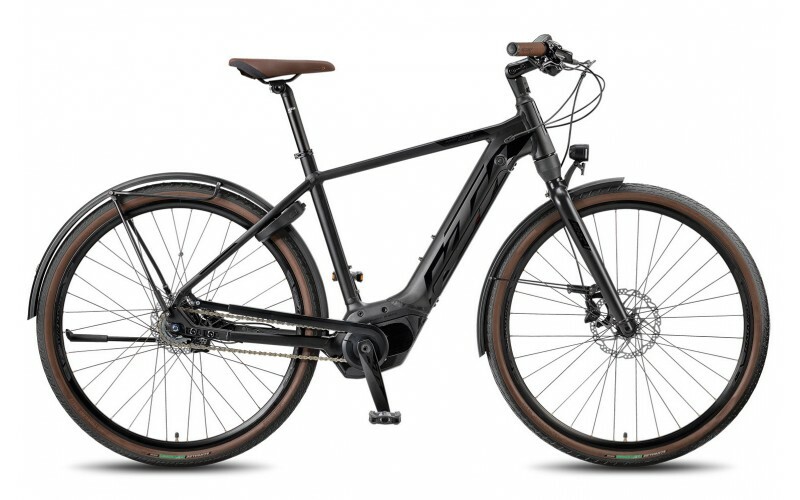 Rivalling the Lundi from Moustache, and the New Charger from Riese & Muller is the Macina Classic 8 A4 KTM eBike. 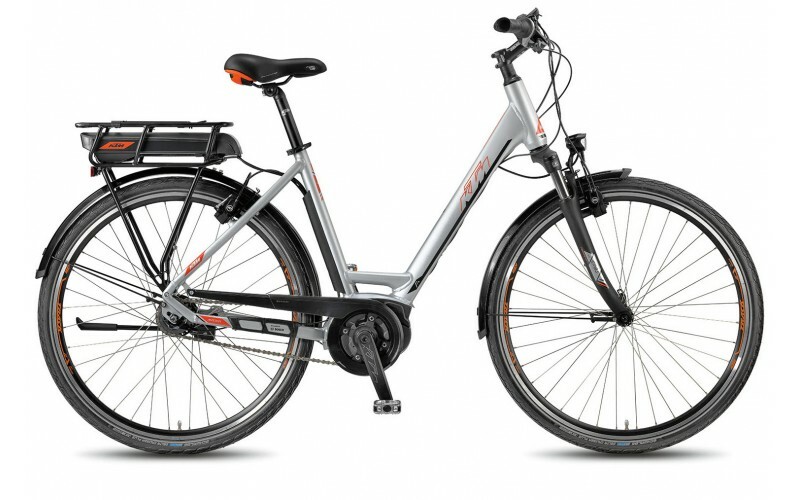 This hybrid cruiser has an 8-speed hub gear, Bosch Active Line motor and a 400Wh battery. It’s easy to hop on and hop off thanks to the convenient step through frame, while comfort is provided by the Suntour CR85 forks. 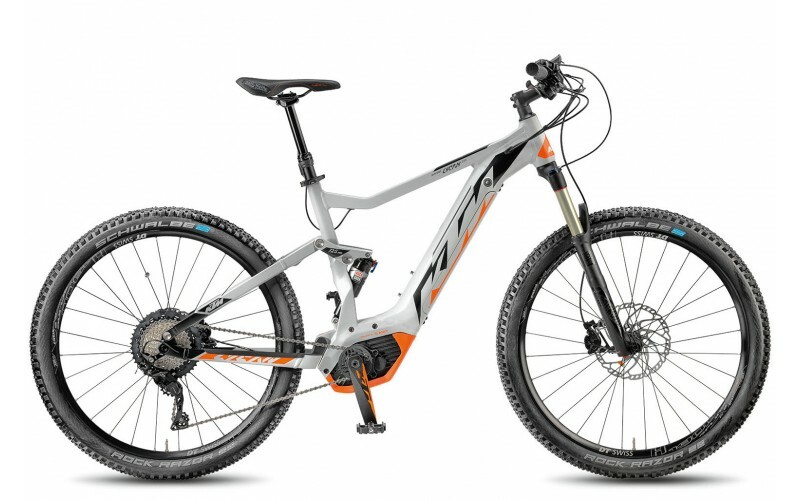 The Fogo is the top spec hard-tail KTM eBike. It uses all the latest production line methods like hydro-forming, drop forging, CNC gravity casting and top spec FOX suspension. 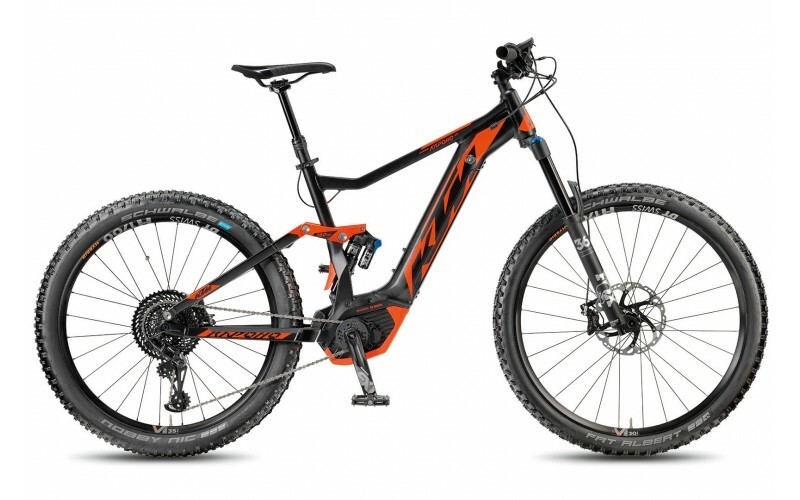 All in all, it makes it a rigid, balanced frame with optimised geometry for the trails. 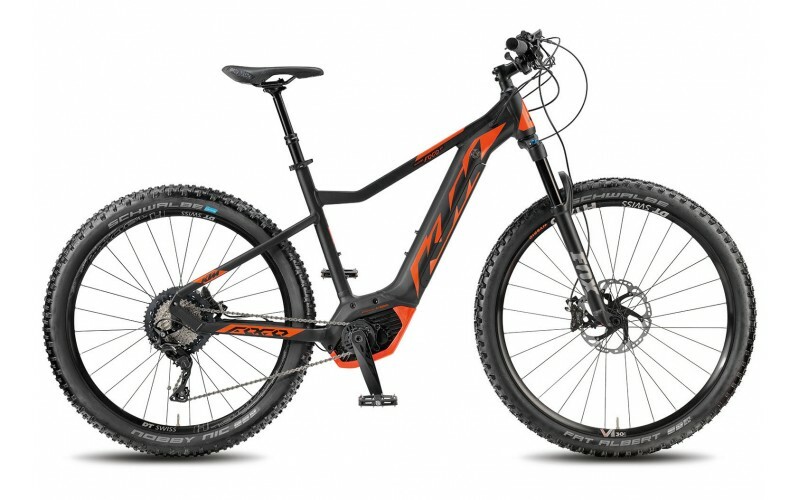 Utilising KTM’s DiMMix wheels, featuring a rear 27.5” for increased traction uphill and a 29” for better handling. Features top spec Bosch electrical components, perfectly capable of powering over tricky terrains and climbing up any hill! Whether you’re riding in the forest, on the alps, jumping down trails or riding on gentle bridleways. The Lycan is capable of tackling anything and everything thrown at it. It uses all the latest production methods, resulting in a playful geometry that’s great fun to ride. High quality spec includes Shimano Deore XT M8000 gearing, BockShox Recond fold RL suspension, and the finest Bosch options available. Once again KTM have managed to build a top end eBike that’s a fraction of the cost of its competitors. For free test-rides and consultations, call us on 0207 911 0977 to book an appointment at our London Bridge Showroom where our experts can help you find your perfect bike. For more KTM eBikes, visit the Official KTM 2018 Range.